Spiritual biography meets edge-of-your-seat undercover reporting: how an American Buddhist smuggled out hard evidence of abuse and torture in Tibet. For nearly a decade, Matteo Pistono smuggled out of Tibet evidence of atrocities by the Chinese government, showing it to the U.S. government, human rights organizations, and anyone who would listen. Yet Pistono did not originally intend to fight for social justice in Tibet-he had gone there as a Buddhist pilgrim. Disillusioned by a career in American politics, he had gone to the Himalayas looking for a simpler way of life. After encountering Buddhism in Nepal, Pistono's quest led him to Tibet and to a meditation master whose spiritual brother is Sogyal Rinpoche, bestselling author of "The Tibetan Book of Living and Dying." Pistono not only became the master's student but also couriered messages to him in Tibet from the Dalai Lama in India. This began an extraordinary, and ultimately vital, adventure. "In the Shadow of the Buddha" is a book about Tibet through the eyes of a devotee-a stranger hiding in plain sight. It's about how a culture's rich spiritual past is slipping away against the force of a tyrannical future. It's about how Tibetans live today, and the tenacity of their faith in the future in spite of dire repression and abuse. It's also about Pistono's own journey from being a frustrated political activist to becoming a practicing Buddhist mystic, a man who traveled thousands of miles and risked his own life to pursue freedom and peace. Matteo Pistono is a writer, practitioner of Tibetan Buddhism, and author of "In the Shadow of the Buddha: Secret Journeys, Sacred Histories, and Spiritual Discovery in Tibet." Pistono s images and writings about Tibetan and Himalayan cultural, political, and spiritual landscapes have appeared in BBC's In-Pictures, "Men's Journal," "Kyoto Journal," and "HIMAL South Asia." Pistono was born and raised in Wyoming where he completed his undergraduate degree in Anthropology from the University of Wyoming, and in 1997 he obtained his Masters of Arts degree in Indian Philosophy from the School of Oriental and African Studies at the University of London. After working with the Smithsonian Institution in Washington D.C. on Tibetan cultural programs, Pistono lived and traveled throughout the Himalayas for a decade, bringing to the West graphic accounts and photos of China s human rights abuses in Tibet. He is the founder of Nekorpa, a foundation working to protect sacred pilgrimage sites around the world, and he sits on the Executive Council of the International Network of Engaged Buddhists, Rigpa Fellowship, and the Conservancy for Tibetan Art and Culture. Pistono and his wife, Monica, divide their time between Colorado, Washington D.C., and Asia." "This story of Matteo Pistono's quest to visit places in Tibet associated with Tert÷n Sogyal, the adept who was a companion of the 13th Dalai Lama, is revealing not only of the Tert÷n's life, but also of circumstances in contemporary Tibet." "Part spy thriller, part Dharma travelogue, part spiritual autobiography, In the Shadow of the Buddha is one hundred percent page-turner. Matteo Pistono's tale of journey's both inner and outer comes packed with adventure and inspiration-a real treat anyone can relish." "What a fabulous saga! A mystical tale of defending the land of the Buddha Dharma at the turn of the 20th century interwoven with the life and death struggle now going on at the turn of the 21st. This moving account is written beautifully from the heart, and it lifts the heart to read it. It is both unearthly and powerfully real. I recommend it with the strongest enthusiasm." 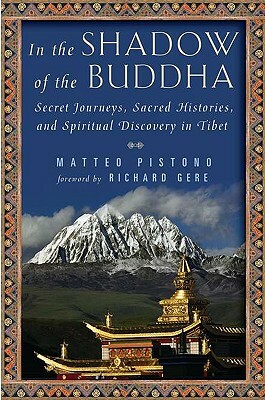 "Matteo Pistono is the James Bond of Tibetan Buddhism. In the Shadow of the Buddha is filled with perilous motorcycle rides, secret documents and romantic liaisons. Pistono also manages to find time to meditate and ponder the nature of the Buddha mind. A heroic, compelling tale that will leave you both shaken and stirred." "Matteo Pistono chose a journey, that inside and outside, would lead him into unfamiliar territory. He followed the path of one of Tibet's great mystics through the Land of Snows, but what he encountered was a mass of contradictions: the elusive past and the intrusive present, brutality and torture greeted with non-violence and compassion, his own anger against all the abuses and a desire for peace and enlightenment. It is this tension of opposite forces and Matteo's desire to transcend them that makes this story fascinating."